What better way to end an appointment with us than to have your teeth whitened in just five minutes? We offer a system called QuickPro by Phillips that’s targeted at removing superficial stains and can be conveniently done at the end of your dental cleaning or any other dental appointment. It is the first dual-layer whitening varnish technology that not only helps to lift stains, but also does so with minimal to no tooth sensitivity. 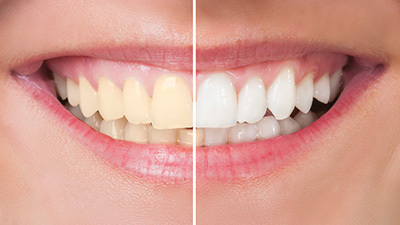 If you are someone seeking a noticeably whiter smile and wants it done quickly and conveniently, give QuickPro Whitening a try here in Las Colinas! Contact 21st Century Dental today. Why Choose 21st Century Dental for Teeth Whitening? The consumption of staining substances, such as coffee, tea, or tobacco products. Teeth whitening is done simply in the comfort of your own home. Patients have an initial appointment at the dental office to determine if their gums are healthy, then impressions are taken and custom trays are made to fit snugly around their teeth. When the trays are picked up a couple of days later, patients are trained on how to perform the procedure. Basically, each night after thoroughly brushing their teeth, they put a small quantity of a special whitening gel into their custom trays and place them over their teeth. Then, they go to sleep. In the morning, they remove the trays, clean them carefully, and brush their teeth normally. This is done over a period of two to three weeks until the desired result is achieved. We use NiteWhite whitening materials in our office because they are continually improving their products. Most recently, they have produced new gel formulations. One allows daytime whitening at a quicker pace while another is specifically designed for those with sensitive teeth. Although teeth whitening is not a permanent treatment, annual touchups of only a few days at a time can maintain the original whitened result.